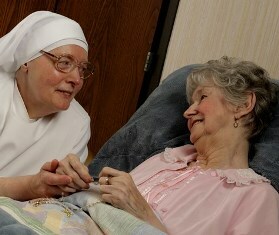 For the past 140 years, the Little Sisters of the Poor have been serving Virginians in need. The Virginia Catholic Conference shares in the mission to serve the poorest and most vulnerable through its advocacy and interviewed Mother Marie, Administrator of the Little Sisters of the Poor’s St. Joseph’s Home for the Aged in Richmond (www.littlesistersofthepoorvirginia.org), to learn more about the vital work of the Sisters locally. The Conference’s questions and Mother Marie’s answers are provided below. Tell us how, when and why the Little Sisters of the Poor started. What is your specific charism? The Little Sisters of the Poor are an international congregation of Roman Catholic women religious founded in France by Saint Jeanne Jugan. Together with a diverse network of collaborators, we serve the elderly poor in over 30 countries around the world. Our congregation was born on a cold winter’s night in 1839 when Jeanne Jugan, a 47 year-old woman from a small village in Brittany, France, opened her home and her heart to a blind, paralyzed old woman who had suddenly found herself with no one to care for her. Jeanne carried her home, placed her in her own bed and cared for her as a member of her own family. Soon more homeless elderly persons sought a home with Jeanne; numerous young women joined in the work, and a new religious community was born. Although the founding of our congregation responded to a great social need at the time, since social assistance for the poor and elderly was sorely lacking in mid-19th century France, the real impetus for Jeanne’s work was the charity that God placed in her heart. From a young age she believed that God wanted her “for a work as yet unfounded,” and she learned to recognize his face in the person of the poor, believing, as Jesus had promised, that whatever we do to the least of his brethren, we do for him. Continuing the work of Saint Jeanne Jugan, our mission is to offer the neediest elderly of every race and religion a home where they will be welcomed as Christ, cared for as family and accompanied with dignity until God calls them to himself. By our vow of hospitality we promise God to consecrate ourselves exclusively to the service of the elderly poor. How do the Little Sisters serve the Church in Richmond and elsewhere? Whom do you serve? Our consecrated life is lived in the heart of the Church as a public, corporate witness to God’s Provident love, and to the humility and merciful love of the heart of Christ. Through our vow of hospitality the Church has given us a mandate to prolong Christ’s mission of charity—to convey to the elderly, in the concrete realities of everyday life, the kindness and love of God for them, his eldest children. Here in Virginia, we welcome needy elderly persons from throughout the Commonwealth into our home, form one family with them, accompany them from day-to-day and care for them with love and respect until God calls them to himself. We provide various levels of support — independent living, assisted living, and nursing care — for about 100 elderly men and women in need. Since arriving in Virginia in 1874, we have provided a home and care for more than 6,500 elderly Virginians who could not afford comparable care elsewhere. Our goal has always been to make them happy, help them to enjoy life to the fullest, and to love them as we would Christ himself. How many sisters and facilities are in Virginia? Elsewhere? We have only one home in Virginia, and it is located in Henrico County (Richmond). This October will mark the 140th Anniversary of the Little Sisters’ first arrival in Virginia. Ten Little Sisters serve in this home. Around the world 2,400 Little Sisters serve 13,000 Residents in 188 homes in 31 countries. Twenty-nine of the homes are located in the United States. The Little Sisters of the Poor have been the focus of media attention recently, due to their pending litigation over the HHS contraception mandate. How would the mandate affect your ministry, and where does the case stand today? Our mission is to serve the elderly poor as a witness to our Catholic faith and the inherent dignity of every human being. Unfortunately, the I.R.S has told us that they will impose enormous fines on our homes unless we violate our religious beliefs and undermine our beliefs in human dignity by participating in the government’s scheme to distribute contraceptives and abortion-inducing drugs. Thankfully, the Supreme Court entered an injunction on New Year’s Eve to protect us from the fines, at least while we continue to litigate the case. Most courts have followed the Supreme Court’s lead and protected other similar religious ministries. But if the courts rule against us, it could mean that the I.R.S. would take millions of dollars from our homes–money that should be used to serve the elderly poor. We hope and pray that won’t happen, and we look forward to spending all of our time, and all of our resources, providing for the elderly poor in our care. How can legislative advocacy efforts—like those of the Virginia Catholic Conference—benefit the Little Sisters in carrying out their mission? Generally, any advocacy efforts on behalf of the sanctity of human life and the needs of the poor and underserved would benefit our mission to the elderly. In addition to the HHS Contraceptive Mandate, we are concerned about specific issues affecting the elderly: maintaining adequate Medicaid and Medicare reimbursement despite government cuts; the shortage of qualified geriatric care givers and much-needed services such as home health and low-income housing; the possibility of rationed care, which would be detrimental to the most frail and vulnerable elderly; and ultimately, the issues of assisted suicide and euthanasia. Although assisted suicide has been legalized in only a few states, it is currently being advocated in several states along the East coast, so it is getting much closer to home. The legalization of assisted suicide or euthanasia would seriously jeopardize our mission. What can Catholics in Virginia do to help the Little Sisters continue serving the community? First and foremost, Catholics in Virginia can pray for more vocations to religious life. Our ability to care for the needy elderly is limited today by the aging of our communities and a diminishment in the number of vocations. Financial support is also important. The annual operating expenses for this home are approximately $6.4 million, 60% of which we must raise through charitable gifts. Because of our faith in God’s Providence and the core principles of our congregation, we do not maintain endowments, and live from day-to-day, trusting in Providence and the generosity of the people of Virginia. From the very beginning, we chose to live with the poor and together with them rely on charity. In order to ensure the dignity of those in our care, we accept the responsibility of going out to beg each day for the goods, services, and monetary donations we need in order to provide for their needs. Those interested in donating or volunteering are encouraged to contact the Little Sisters at devrichmond@littlesistersofthepoor.org or at 804.288.6245.